The ‘Lightweight’ Class races on the Billown course have produced close, exciting races over the years and this year appears to be no exception to the rule with two races taking place on the Tuesday evening and on the afternoon of Championship Day, Thursday. Both the Station Garage and the Steam Packet Company six-lap races for 125cc; 400cc; Moto3 and eBikes will be history making as ‘petrol-engined’ machines will line-up on the grid with eBikes - a first for an International mass-start road race. The University of Nottingham riders Daley Mathison and Chris Foster are looking forward to the new experience of racing their UoN-02 Electric Motorcycles on the Billown Course and challenging the conventional racing machines. 25-year-old professional road racer, Daley Mathison finished third on a similar UoN machine in the TT Zero Race 2016 repeating the feat this year and was the 2015 European MotoE Champion, he hails from Stockton-on- Tees. Team-mate Chris Foster is 40-ish lives and in 2015 finished in third place in the European MotoE Championship. Both of last year’s race winners, Ballymoney riders, Darryl Tweed and Seamus Elliott return on their 400 Kawasaki machines and will be up against other previous victory men, Alistair Haworth (Millom) and local Ballasalla man Dave Taylor. Others hoping to spoil the party include (in no particular order) Mick and Mark Goodings from Doncaster, Stockport’s Adrian Kershaw, Michael Russell from Salisbury, Paul Gartland from Ederney and Rad Hughes who comes from Thorne. The Moto3 ‘boys’ are headed by Manxie Dan Sayle and Ballymoney’s Paul Robinson, who last year campaigned a 125 Honda. Interest in the ‘Ultra-Lightweight’ category will centre around the Joey’s Bar Hondas of Gary Dunlop and Derek McGee who is making his Billown debut. Other 125 regulars include Guildford’s Tom Snow and Lisburn, Country Antrim’s Peter McKillip. There are eight newcomers in the race - David Howard - Skerries; Bob Masters - Uckfield; Derek McGee - Coole; Neil Lloyd - Wednesbury; Ben Heaton - Bolton; Andy McAllister - Bangor (NI); Peter Fletcher - Bushmills and Enda Trearty from Letterkenny. Formed in 2014 the UoN eBike Team finished third in the MotoE European Race Series with an Agni Bike. 2015 the team fully designed and built their own bike, which finished fifth in the TT Zero Race, securing the University Prize. The UoN Team also won the European MotoE Championship. Last year saw them retain the Euro Championship and add the runner-up spot to their record, as well as finishing third in the TT Zero Race, which they repeated last month on the Mountain Course. Headed by Dr Gimeno-Fabra the team competes across the globe pushing the development of eBike technology. “Our main goal is to push the limits of the available technology, and in doing so also teach our students what they can do with their degrees. Far from just being another University project we are a racing team, and competing at the highest level is what we want to do. Being able to race at the Southern 100 which is such an iconic road race is fantastic, there is nothing like road racing to test the capabilities of any machine. ‘We hope to put up a good show and be competitive against the petrol bikes which is something unprecedented. We are delighted to be able to partner with Darvill Racing for this event, their technical knowledge and experience is outstanding, but they also fit with our team values and work ethics”. 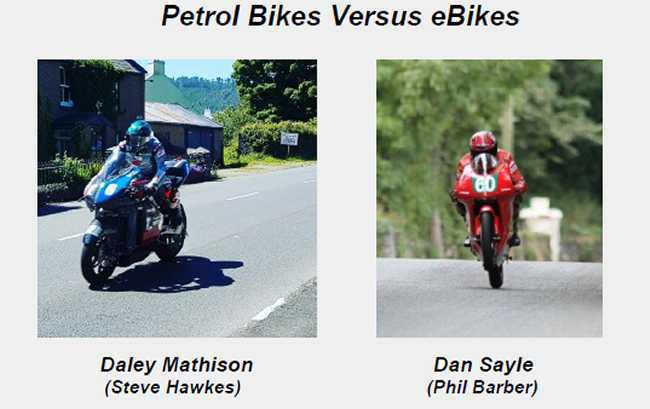 In the ‘cut and thrust’ of the Lightweight action it will be interesting to see how well the eBikes are able to challenge the power and speed of their two and four-stroke rivals as history unfolds once gain around the 4.25-mile Southern 100 course.